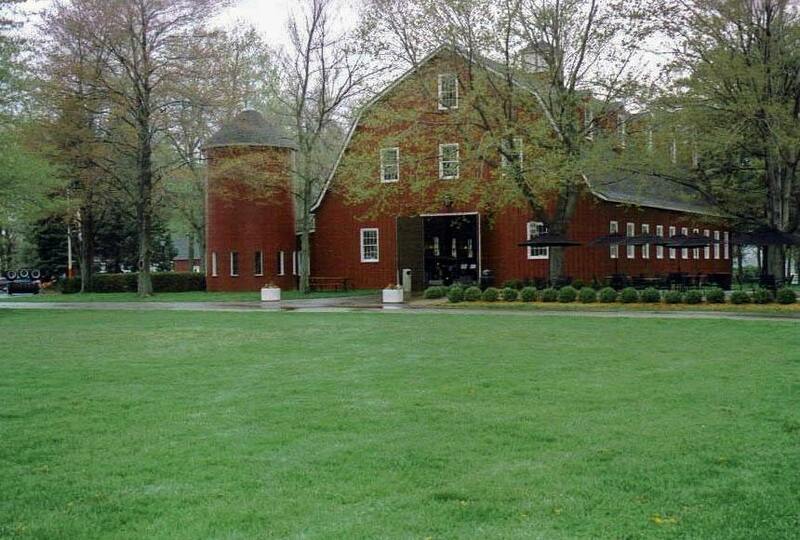 Beautifully restored barns house Gilmore’s fascinating collection of incredible machines. The South African wheat miller in the passenger seat beside me tried to bait me with tall tales from his homeland: lions roaming the city streets of Durban and diamonds so abundant that you can just pluck them out of the rivers. But I wasn’t a gullible rube who doesn’t know where Durban is, and I wasn’t falling for his raillery. We had met over breakfast at the Brayton House in Grand Rapids, where we were staying — he on a business trip without his family or a car, me on a vacation around the state of Michigan. When Henry inquired about my plans for the day, he asked if I would mind if he accompanied me. Chances were good that I’d never meet another South African wheat miller in my lifetime, so I invited him along to ride shotgun. We hopped in my car and headed to Hickory Corners, home of the fantastic Gilmore Car Museum — a sprawling repository of 400 automobiles spanning 100 years housed in restored historic barns. Something Jay Gatsby would drive. 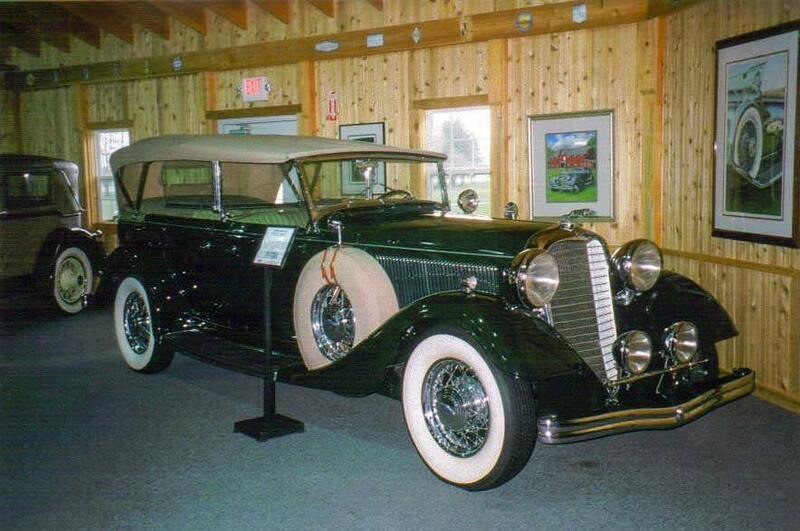 The museum started as a hobby of Donald S. Gilmore, when he began acquiring vintage automobiles in the early 1960s. While restoring a 1920 Pierce Arrow, Gilmore’s hobby rapidly progressed into a passion, and he soon purchased 90 acres of land in southwestern Michigan to hold his collection. His wife, Genevieve, suggested that he open his collection to the public, and, together, they launched the Gilmore Car Museum in 1966. Henry and I began to explore the museum, marveling at the incredible machines that used to run along our roads from the very late 1800s through much of the 1900s, and the extraordinary care with which Gilmore and the staff have treated them over the decades. Running boards and huge headlights are typical of the great cars of the 1920s and 1930s. The collection starts with a Locomobile from the 1890s, when the horseless carriage was considered a passing fad exclusively for the amusement of the rich. Clearly, those early predictions were entirely wrong — today, 253 million cars speed along (or sit in mind-numbing traffic) streets, bridges, and highways in the United States alone. As we popped into the barns dotting the green grounds, we found highly polished Ford Model A and Model T cars — all black; a 1903 Michigan; a 1929 Dusenberg that cost $20,000 to purchase at the time — a veritable fortune that only the über-rich could afford; mint Lincolns and Chryslers; the spectacularly failed Edsel; the odd 1946 Stout; and a 1947 DeSoto. Cars from the 1920s and 1930s with massive bonnets, giant headlights, and wide running boards conjured up images of flappers in high spirits and fringed dresses. 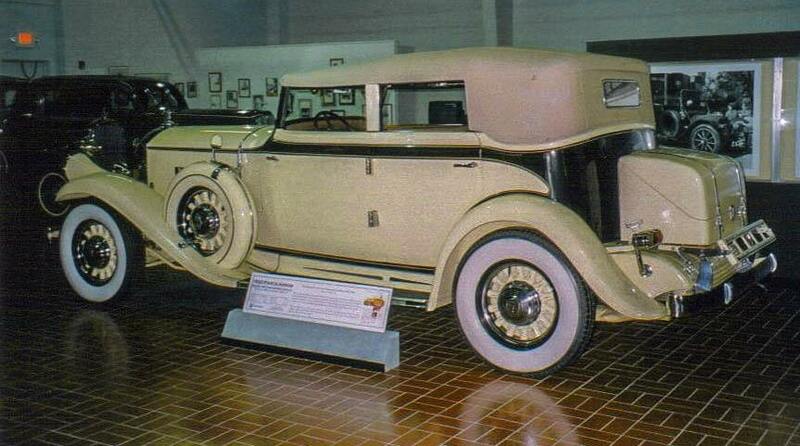 I could almost see gangsters and their molls fleeing from coppers in a 1934 Packard. 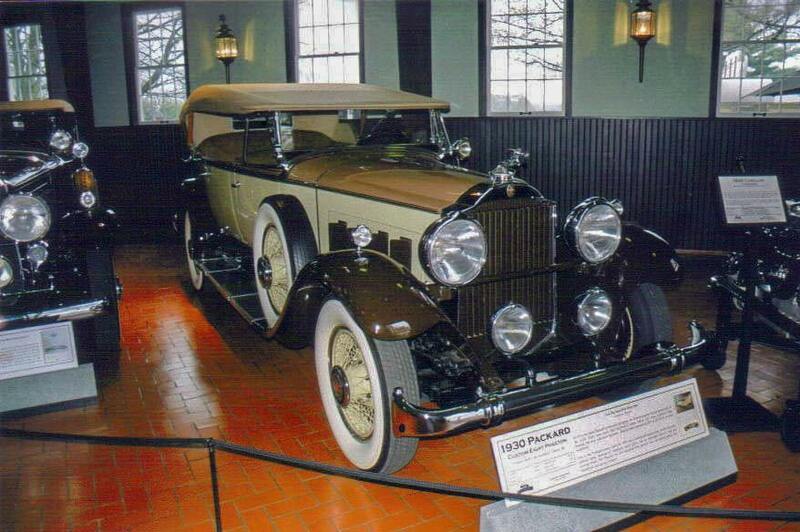 A 1930 Packard in mint condition. The collection does not restrict itself to only passenger cars. It also includes racing cars, motorcycles, trucks, and Checker cabs. In addition to these fantastic vehicles, the museum has assembled more than 1,500 distinctive hood ornaments, also called car mascots, and tells the story of how they evolved from mere thermometers and radiator caps to corporate logos to symbols of the car itself. The speed of the car was represented in the chrome dogs, antelopes, birds, and rabbits sitting at the front edge of the hood, or in the glass archer on a Pierce Arrow, or in the “Spirit of Ecstasy” on a Rolls-Royce. These ornaments also provide a miniature lesson in 20th-century art, as they flow through the great styles of the 1900s: Beaux Arts, Art Nouveau, Art Deco, and Modernism. It was too early in the day to stop for lunch at the museum’s George & Sally’s Blue Moon Diner, a historic roadside diner relocated from Meriden, Connecticut, but it would have been fun to sit at the counter and enjoy a blue-plate special and some homemade pie just like its customers did 75 years ago. 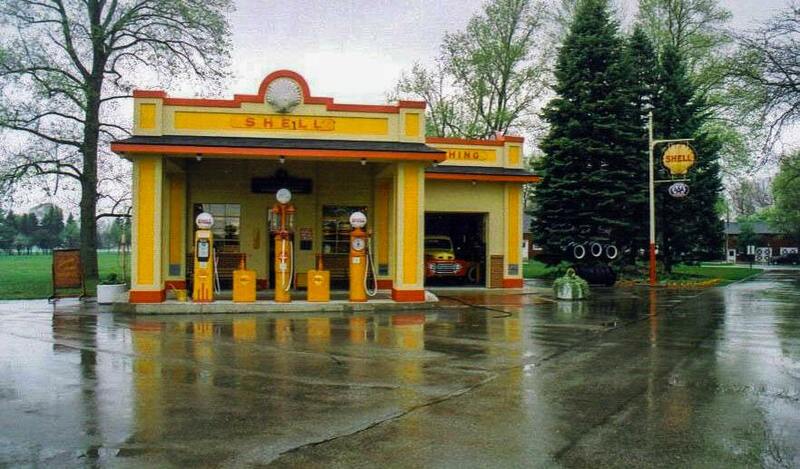 A recreated Shell gas station comes complete with the odor of motor oil. Instead, we poked around a recreated 1930s Shell gas station, complete with all the tools of a full-service garage you’d expect from that era, a sign advertising “Shellubrication — The Modern Upkeep Service,” and the smell of motor oil. Here, the price of a gallon of gas is permanently fixed at 18 cents. When we returned to my rental car, Henry and I exchanged glances that reflected out identical thoughts: My Toyota Prius, although highly practical, just didn’t seem as exciting or as interesting as any of the cars we had just seen. And we both knew that gasoline on the way back to Grand Rapids was not about to cost 18 cents.